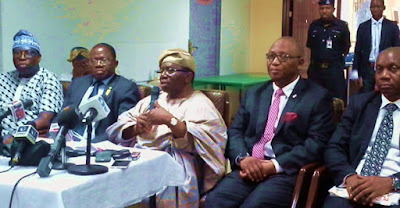 In order to ensure healthcare delivery to Nigerians, the Minister of Health, Prof. Isaac Adewole has said directed that all accident and emergency cases should be treated within 24 hours in Lagos University Teaching Hospital ( LUTH). Addressing journalists at LUTH, the minister said that "the hospital should operate a system that will evacuate patients within 24 hours. Once first aid treatments have being given to a patient, the patient should be moved to the ward. "If the emergency unit is congested, it will not be able to attend to emergency cases. The situation I saw this morning is not encouraging." He said the Accident and Emergency unit which is the face of the hospital should be fully active adding that no one will get good credit if the emergency cases are not responded quickly. The Minister also stated that "we cannot deny poor Nigerians medical care because they do not have the means. We are going to cater for the genuinely poor Nigerians until a form of health scheme is put in place to cater for the poor. We beg Nigerians not to deceive and ruin the system. "This is so because about 60 per cent of Nigerians are poor and cannot afford medical care. We want to use the primary health cares to address this issue. "The Federal government wants to reposition the health system, where 70 per cent of Nigerians will go to primary health care centres, 25 per cent can go to secondary health care centre and five percent can visit LUTH and other tertiary health care centres and by that way the system will work." On the issue of Lassa Fever, Adewole said about 60 percent death have being recorded in Nigeria, stressing the need to improve on the laboratories in the country. The minister however appreciated the Chief Medical Director, CMD, of LUTH for rehabilitating the water equipment plant that have been abandoned for over 25 year now. He charged the media and Nigerians to fight for the health sector by calling for more funding into the sector. 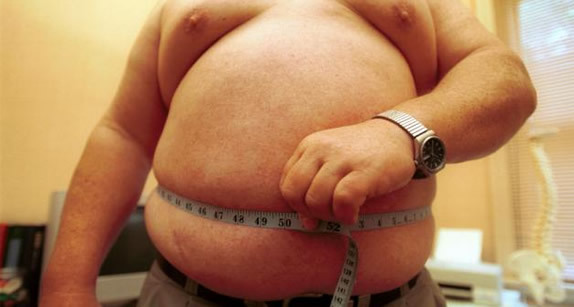 Over one in eight adults are now obese - a ratio that has more than doubled since 1975 and will swell to one in five by 2025, a major survey reported Friday. Of about five billion adults alive in 2014, 641 million were obese, the data showed - and projected the number will balloon past 1.1 billion in just nine years, an online report said. The research warned of a looming crisis of ‘severe obesity’ and disease brought on by high-fat, high-sugar diets causing blood pressure and cholesterol to rise. People are divided into healthy or unhealthy weight categories based on a universally-adopted measure dubbed Body Mass Index (BMI) - a ratio of weight-to-height squared. One is considered underweight below 18.5, overweight from 25 up, and obese from 30 - when the risk of diabetes, stroke, heart disease and some cancers escalates massively. 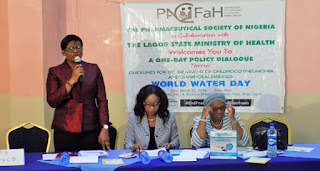 Stakeholders in the health sector have urged Lagos state government to create policy direction for Amoxicillin Dispersible Tablet (Amoxicillin DT) and Zinc/ Low Osmolarity Oral Rehydration Salt (Zinc/LO-ORS) in order to address childhood Pneumonia and Diarrhea. L- r: Dr. Mrs. Moyosore Adejumo FPSN, representing the Commissioner for Health, Lagos State, Dr. Jide Idris, making a remark; Dr. Mrs. Monica Eimunjeze, Director Registration & Regulatory Affairs, National Agency for Food and Drug Administration and Control (NAFDAC) and Pharm. (Mrs.) Sherifat Salami, Director, Pharmaceutical Services, Lagos State Health Service Commission during a one-day policy dialogue on the use of Amoxicillin dispersible tablet and Zinc/low osmolarity oral rehydration salt in the management of childhood pneumonia and diarrhoea held recently, which was in conjunction with the World Water Day at Dover Hotel Ikeja, Lagos State. Declaring open, the one day policy dialogue, the Lagos State Commissioner for Health, Dr. Jide Idris who was represented by the Director, Pharmaceutical Services Lagos State Ministry of Health, Dr. Moyosore Adejumo told journalists that though there is no state policy on Diarrhoea and Pneumonia management, adding that management of these at the health facilities is in line with World Health Organisation(WHO) and United Nations Children Fund (UNICEF) guidelines. He said that the state is currently integrating the existing central health commodity supply chains to increase availability of medicines and diagnostics across the State, so as to effectively tackle childhood Pneumonia and Diarrhea. On the improvement in the knowledge and skills of health workers across the state, he said, it will help increase appropriate diagnosis and proper treatment of the diseases. According to him: "Childhood Pneumonia and Diarrhea are leading killers of under-five children; in 2013 alone, about 1.5 million children died globally and about 400, 000, (Diarrhea-201, 368 Pneumonia-177, 212) died in Nigeria. In Lagos State, Pneumonia and Diarrhea accounts for approximately 9 percent and 10 per cent of deaths of under-five children respectively. "As at 2015, there is 76 per cent availability of Zn/LO-ORS co-pack across the 280 Primary Health Centres in the 57 LGAs/LCDAs in Lagos State. We will ensure community participation in the management of childhood pneumonia and diarrhea through awareness creation and ownership." In his speech, the President of Pharmaceutical Society of Nigeria, (PSN), Pharm. Ahmed Yakassai said Local Healthcare Providers and Private Sector Actors (Manufacturers, Distributors, and Community Pharmacies) are encouraged to increase production, distribution and appropriate promotion of the use of these commodities. He added that frontline health workers including Community Pharmacists and Proprietary and Patent Medicine Vendors (PPMVs) should be trained to identify the danger signs of childhood Pneumonia and refer appropriately. Giving the update on the registration and regulatory environment of the child health commodities Amoxicillin DT, Zinc and Lo-ORS in Nigeria by Dr. Monica Hemben Eimunjeze, Director Registration and Regulatory Affairs, National Agency For Food and Drug Administration and Control,(NAFDAC), added that Zinc tablet should be used in combination with low osmolarity oral rehydration salt (LO-ORS) in all cases of childhood Diarrhea, stressing that the Zinc tablet when used for the full recommended ten days can protect the child from Diarrhea for the next 2-3 months. She however added that NAFDAC will sustain, strengthen existing processes and systems to ensure that lifesaving commodities available within our jurisdiction are of good quality, safe and efficacious. At the end of the dialogue, a communique was drafted with a recommendation that the state government should develop a Standard Treatment Guidelines document that will include childhood Pneumonia and Diarrhea commodities. Karakas explained: “We currently offer the largest number of O&D pairs in Africa – a total of 11,472 origin-to-destination pairs on the African continent. Talking about the expansion of routes Turkish Airlines wants specifically in Nigeria, Karakas explained that they currently fly from three locations in Nigeria, namely Lagos, Abuja and Kano, but would like to also fly from Port Harcourt and a few other locations. In addition to that, the airline also wants to double its daily flights in and out of the three current locations. These requests, Karakas said have since been tabled before the presidency as well as the aviation ministry.